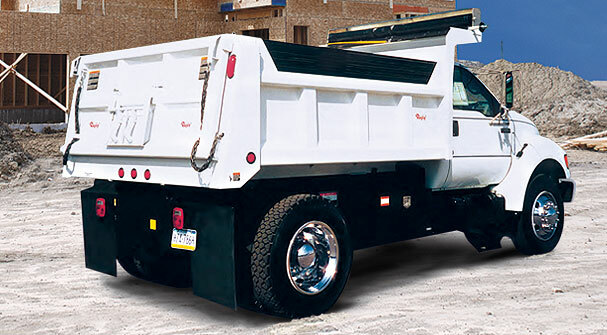 Rugby's Titan Series Dump Bodies are designed to meet your bigger capacity, class 5-7 needs. 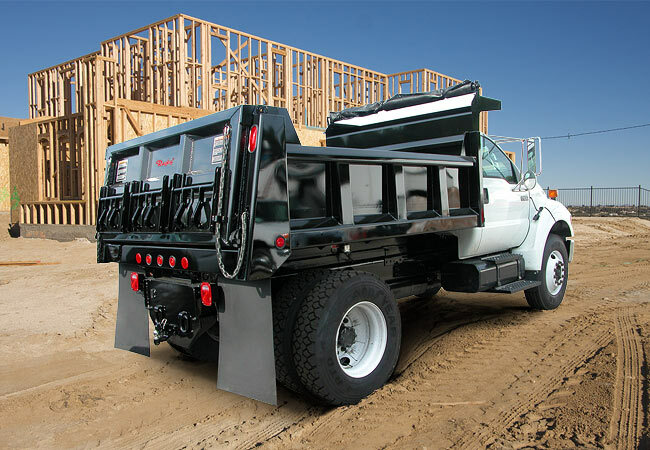 Titans feature a sleek yet strong look, a dirt-shedding top rail, 10 degree sloped tailgate and radius front corner posts. 10 gauge steel on side construction. 7 gauge steel floor with radius corners. 10 foot 6-8 yard body standard all 8 gauge. Sides equipped with brackets for sideboard extensions. Fully boxed dirt-shedding top rail. 45 degree sloped rub rail. Three vertical boxed braces per side. Radius front corner posts with recessed clearance lights on lower post. Tapered Full height rear corner posts 5 inches deep. Front has fully boxed top rail with v-bend reinforced front panel. 7" structural channel long sills and 4" I beam cross sills on 12" centers. New oval-shaped stop/turn/tail lights in upper rear corner posts with side clearance lights on lower post. 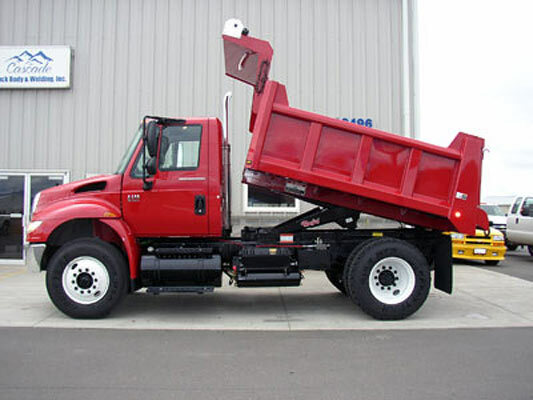 Optional all 7 gauge on 5/7 yard dump body. Sloped 10 degree inward and recessed flush with rear face of corner posts. Two-way tailgate with adjustable rod on trip lever. Fully boxed frame, reinforced with two tapered verticle braces and one tapered horizontal brace. Angle iron reinforced decking at rear, ensures longer lasting gate seal. Heavy duty 1.25" lower pins on tailgate, upper pivot arms are of .75" plate. Grease fittings on upper pivot arms. Equipped with spreader chains and banjo eye chain holders in corner posts.